Often painful, especially in infants, it is sometimes difficult to stop the onset of ear infections or otitis. An ear infection can occur alone or accompanied by other classical early childhood diseases, such as nasopharyngitis or angina. Fortunately, 80% of ear infections heal alone or by using natural remedies. In addition, 90% of acute otitis media are of viral and non-bacterial origin. In this context, antibiotics have no efficacy. The most difficult thing is to distinguish between ear infections that will not cause complications from others. For this reason, it is necessary to consult a doctor to determine the cause of the ear infection. 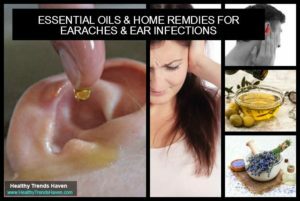 In this article we will introduce you essential oils as well as natural and home remedies for ear infections. 1. 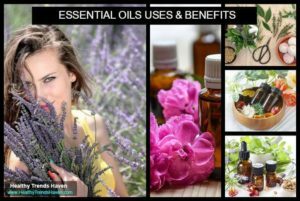 How Can Essential Oils Cure Ear Infections? 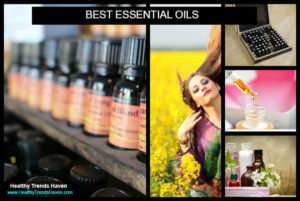 Essential oils are aromatic highly volatile oils that are to be found in different parts of the plant. They give each plant its distinctive scent that makes it distinguished from the other. 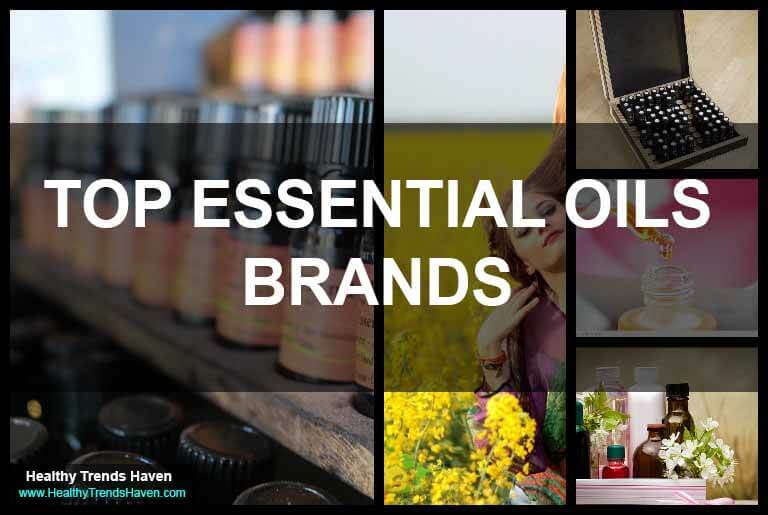 Essential oils are found in the flowers, the seeds, the bark and even the leaves. 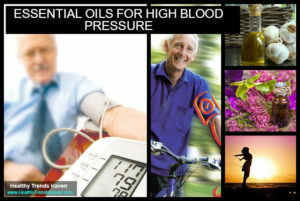 These volatile oils have been extracted and used by men for thousands of years for their numerous benefits and uses. 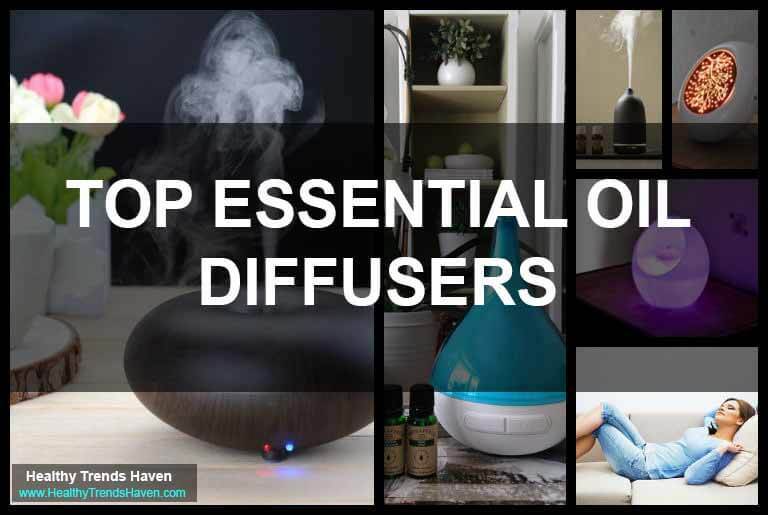 Apart from giving a beautiful scent when used as a body rub or when thrown on fabric or around the house, these oils have also therapeutic uses and benefits and can be used to treat a lot of health issues. They can be used to help cure wounds, in massage and to treat some infections. 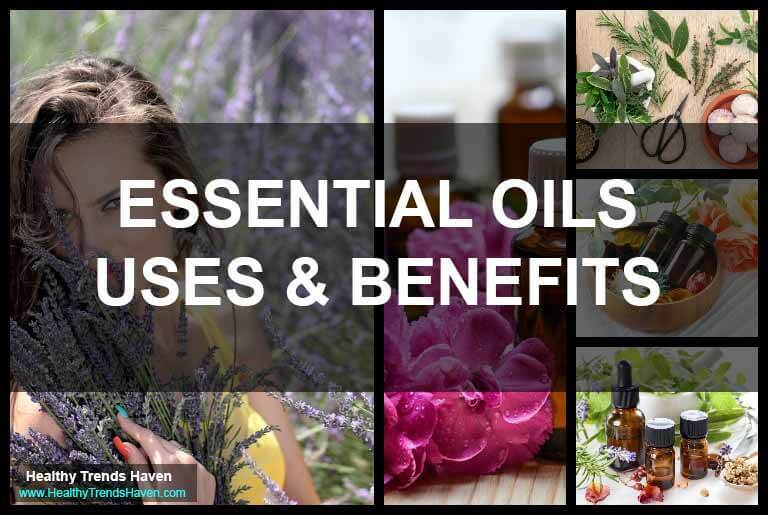 Many essential oils have antibacterial and antimicrobial effects. 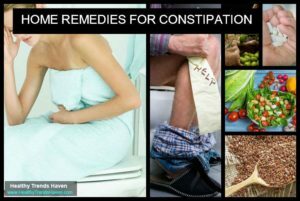 This means that they can effectively treat different kinds of infections in the body. An ear infection happens when there is a bacterial, viral or fungal infection that affects a part of the ear. This is usually highly painful because it causes inflammation and fluid buildup behind the eardrum. Sometimes the outer ear part gets infected too. This will cause itchiness or scales that will also block the way to the inside of the ear. You might experience excessive ear wax production or you might be dealing with some sort of painful inflammation that will keep your ears sore. Viruses take over the body by infecting the healthy cells and then they will use these cells to replicate and create more virus cells. 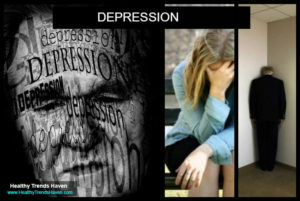 Essential oils prevent this process from happening by stopping the virus cells from multiplying and creating new ones. Bacteria can also be fought by essential oils that affect the chemical composition of the bacterial cells. They can stop the bacteria cells from getting food and this will cause them to die. For thousands of years, people have used essential oils to clear ear infections because they are naturally based and because of their healing powers. 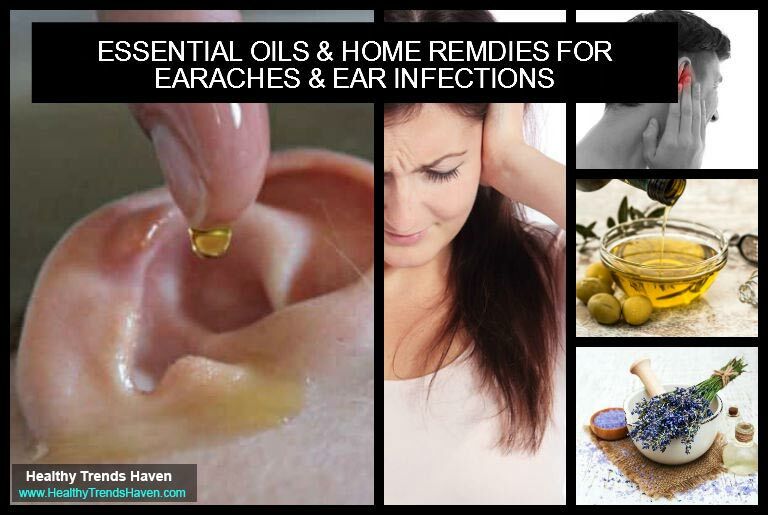 Many people will resort to essential oils to treat different earaches and ear infections because they are natural and most of them will not have adverse effects unlike medications. They are also relatively easy to use and will clear an infection in most of the time. 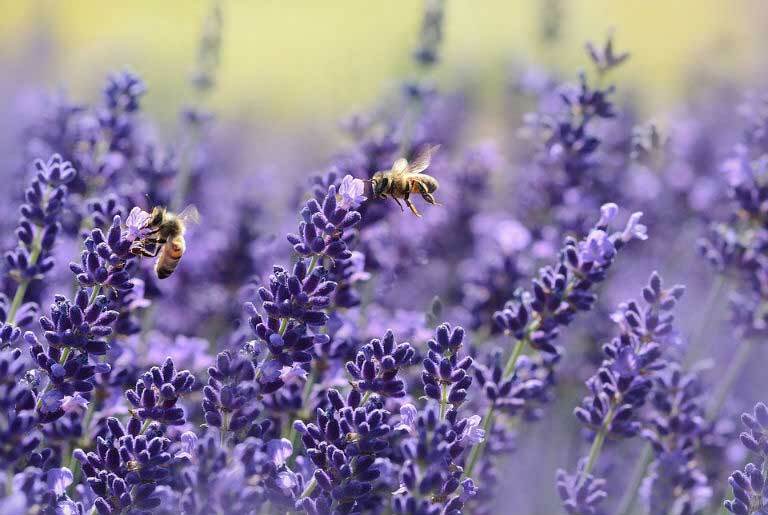 Lavender essential oil is a strong analgesic. It is composed of linalool and linalyl acetate which have a major role to attenuate the brain’s response to pain. By these two substances, the essential oil of Lavender will be of great help to relieve the pulsatile pains of acute ear infection. Moreover, its calming and sedative properties help the sufferer of ear infections to avoid sleepless nights by promoting sleepiness despite pain. 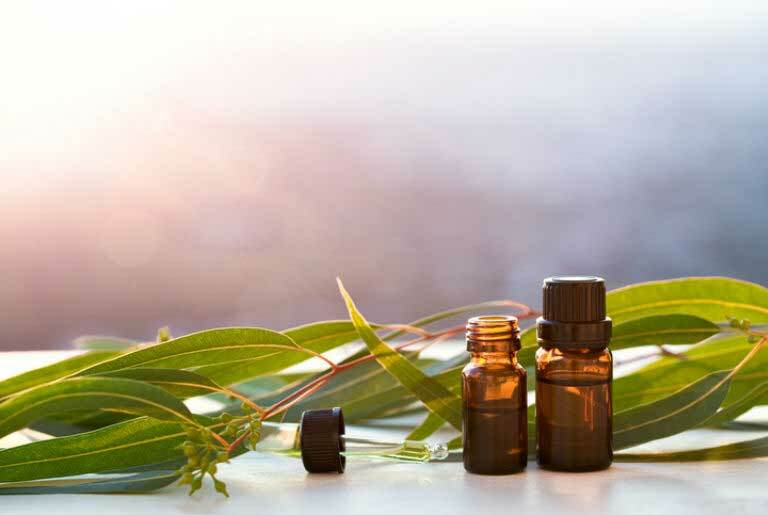 Due to its biochemical composition rich in eucalyptol and terpenes, which have a pain-relieving and soothing action, Eucalyptus Radiata essential oil will relieve the pain associated with ear infections and will rapidly stop its symptoms so as to avoid damage to the ear. This essential oil has strong antiviral properties too. Its action helps the body to defend itself more effectively. Its chemical composition neutralizes viruses to prevent them from reproducing but it also helps the cells to resist their attacks by fortifying them. For these reasons, Eucalyptus Radiata essential oil is very effective to fight viral ear infections. In addition, this essential oil acts quickly, effectively and naturally against bacteria by preventing their reproduction. In conclusion, the essential oil of Eucalyptus Radiata acts on the cause of the infection of the ear while preventing any bacterial superinfection. Tea Tree essential oil is very suitable for ear infections because it is immunostimulant (stimulates the immune system), antiviral and anti-infectious. You can use it in preventing infectious diseases and also at every stage of these diseases. 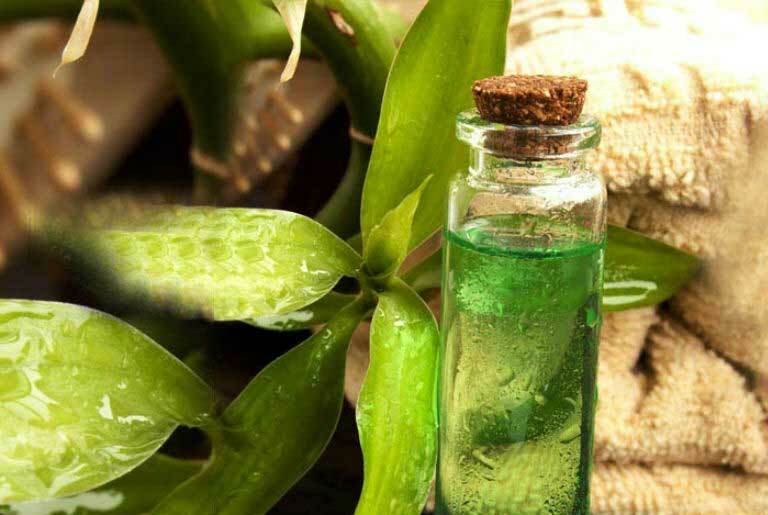 It is one of the best oils that could be used to treat skin rashes and insect bites because it effectively reduces the swelling and the inflammation. It also works very well to treat acne as it can effectively kill the acne causing bacteria. 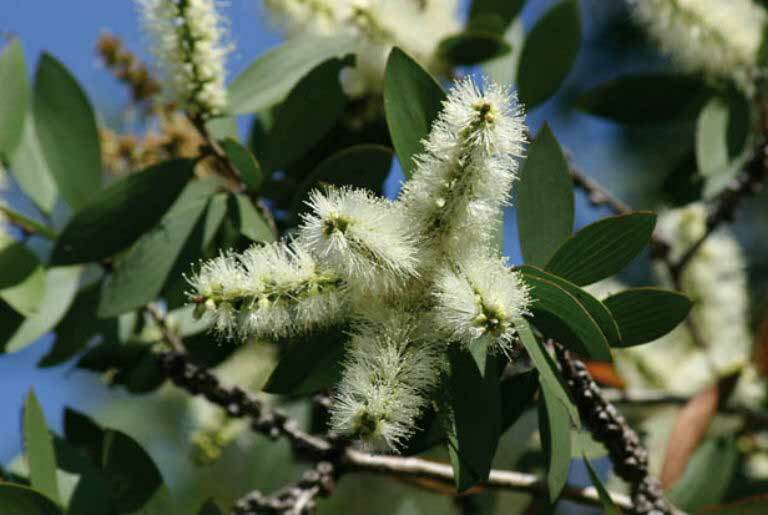 Tea Tree essential oil can also be used as massage oil because of its strong healing aroma. Due to these therapeutic properties, Tea Tree essential oil is a must-have remedy to fight ear infections. It can be used in several ways alone or mixed with a vegetable oil. Thyme essential oil is one of the most effective essential oils for ear infections. It is mostly used for its aromatic uses as it has a refreshing strong smell. But it can also be used as a mouthwash, as massage oil and an ointment. 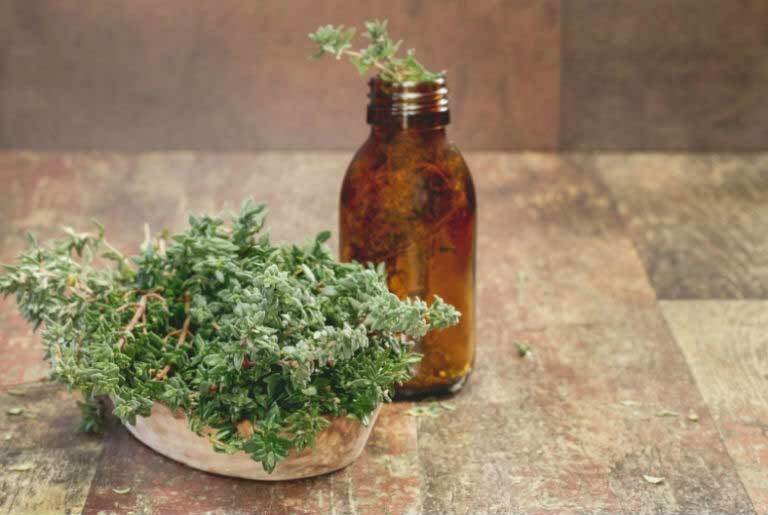 Thyme essential oil is a powerful anti-infectious. It is rich in Linalool (up to 36%) which is known for its analgesic, anti-inflammatory, sedative, anti-oxidizing, antiseptic and antiviral properties. Thyme essential oil will then be effective in fighting the bacteria responsible for the infection or the superinfection of the ear. This essential oil can be simply rubbed on the outside of the ear to clear an infection or a cotton ball can be soaked in it to be stuffed in the infected ear overnight. Niaouli essential oil has been used for more than a century for its anti-infectious and restorative virtues. In addition, it is a strong analgesic and can create numbness in a painful area to stop the pain. It acts also on wounds and inflammations of any kind. – Mix 1 drop of Niaouli essential oil and 5 drops of oilve oil. – Massage around the ear. Garlic is one of the oldest oils used to clear infections because of its strong healing powers. It has been used to clear infections for thousands of years. 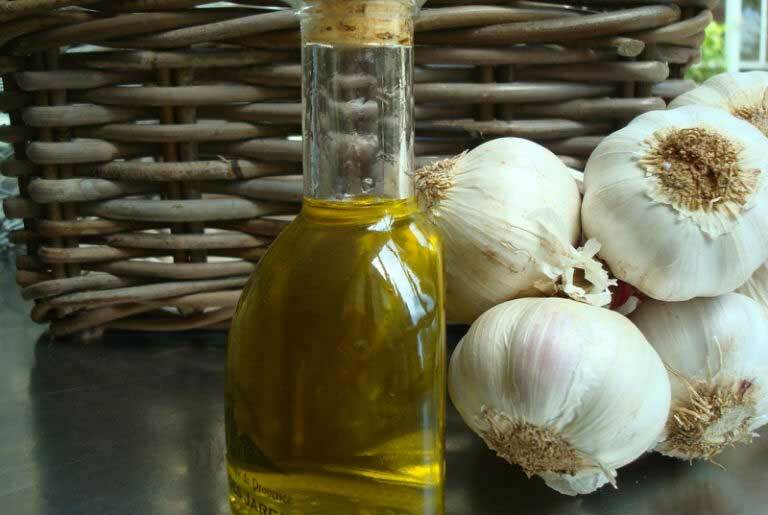 If you don’t have garlic oil, you can prepare your own garlic oil treatment by crushing fresh garlic cloves into some olive oil, then soak a cotton ball in this mixture and put it in the infected ear for some minutes. Other way, you can mix some drops of garlic oil with olive oil in a dropper and apply the mixture inside your ear as long as the eardrum is intact. Mullein (Verbascum Thapsus) is a large biennial plant that can measure up to 2 meters and grows in dry soils and débris. It is a beautiful plant with flowers of a beautiful golden color. 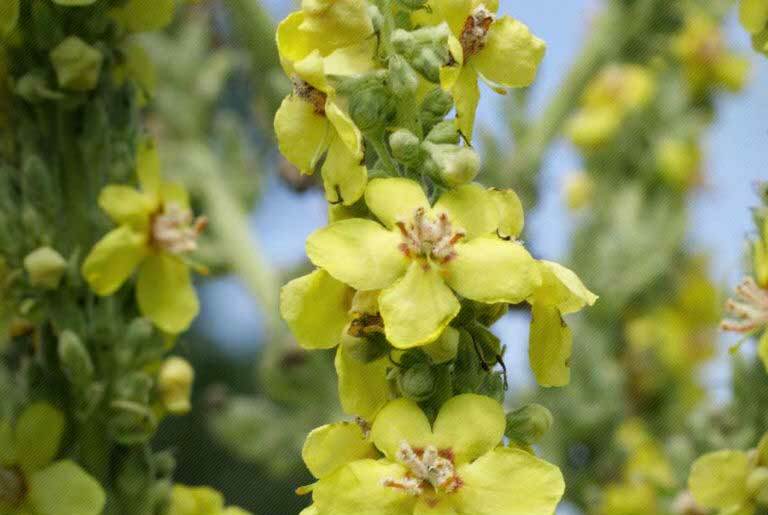 Mullein flowers are composed mainly of chemical substances like mucilage and iridoids, which give it several therapeutic properties like anti-inflammatory, antibacterial, antifungal, and antiviral. These virtues help treat respiratory tract diseases such as asthma, coughs and other lung diseases. Its softening properties will calm colds and facilitate breathing and expectoration. Recently, researchers and scientists have found that the flower of this plant contains Glycyrrhizin acid; a strong antiviral and anti-inflammatory agent that can be used in fighting some tumors. All these properties make mullein a very respected remedy to treat ear infections too. Usually, Oils are rubbed on the outside part of the ear canal or used as ear drops. Some essential oils need to be diluted and can be easily mixed with olive oil for that purpose. However, you shouldn’t drop any essential oils in the ear if your eardrum is punctured. Essential oils will help clear infections in a short period of time. 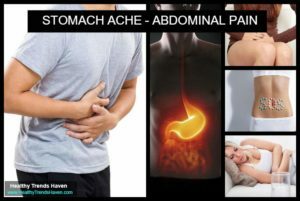 However, if you see that your infection still persists and that your pain is not getting any better, then you need to see a doctor. 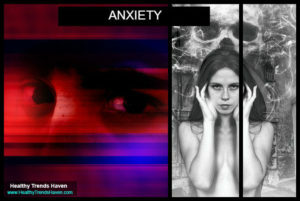 The problem might need to be treated with some antibiotics or might need another intervention. Mix the essential oil drops with the vegetable oil in a non-reactive bowl. Apply 3 to 4 drops of the mixture around the ears. Renew the application 5 to 6 times a day for 5 days. Mix these drops in a non-reactive bowl. Use 2 to 3 drops of this Massage mixture around the ear 4 to 6 times a day. You will enjoy the benefits of this synergy of anti-inflammatory, antiviral and anti-bacterial essential oils. Mix the oils in a glass dropper bottle (for better conservation). Place 4 drops of the mixture on a small piece of cotton to make a cotton ball, Then place it in the ear canal three times a day. You can also apply 6 drops around the ear then massage gently. Mix the oils in a spoon. If you don’t have garlic oil then you can squeeze a fresh garlic clove and collect 3 drops of juice and add it to the mixture. Lightly heat the mixture with a lighter placed under the spoon for a very short time. Test the mixture inside your wrist to make sure it is not too hot. Soak a cotton ball in this mixture and put it in your ear. Place a hot water bottle over the ear and rest. Most of the time you can use essential oils alone or mixed together to cure ear infections. As explained above, these oils have super healing powers and will help with any ear infection that will lead to pain and discomfort. If you have the required essential oils then you can make your own recipes as explained in the previous section. Another alternative is to buy a ready blend or mixture. There are thousands of brands in the market and it is not easy to be found there. Below, we have chosen for you the best blends that have proven their effectiveness in fighting and avoiding ear infections. This is a mixture of Mullein, Calendula, St. John’s Wort flower extracts, and Garlic bulb extract. The whole mixed in organic olive oil. The combination of these components creates an impressive synergy and makes this mixture one of the most effective blends for ear infections and earaches. This mixture is really proven to cure ear problems and gives positive results in few days. It has helped many people curing recurrent ear infections. It can be used to massage the outside of the ear or by pouring a few drops into the inner canal. For adults and also for children. In the form of a 100% natural drops, this product is composed of several homoeopathic and natural ingrédients like Calcarea Carbonica 30C, Sulfur 30C HPUS which have virtue to treat the ears and others like Chamomilla 30C HPUS and Belladonna 30C HPUS which Have calming and soothing virtues. This product is recommended for ear ailments due to flu, colds, allergies. It is known to be safe and effective and has been clinically shown to reduce earache symptoms, including throbbing pain, itching and irritability, during the first hours. Recommended for adults and children from 2 years. MADE IN USA – Prepared in an FDA approved laboratory, this blend is a mixture of oils known to be very effective in curing ear infections; It is composed of pure olive oil, garlic oil and lavender essential oil. Due to this composition, this blend is an excellent anti-inflammatory and antibacterial. It is ideal for relieving minor ear pain or ear infections, but also can be used to avoid ear infections. Moreover, it can be used to relive allergies, for post nasal drip and against snoring. This product is not used to cure ear infections but used only to prevent and avoid them, especially swimmer’s ears and all ear infections that could be caused by watersports. It is composed of Isopropyl Alcohol (95%) and Anhydrous Glycerine (5%). Isopropyl alcohol and glycerin drops in each ear after a swim, dive or shower will quickly dry up any water that remains trapped in the ear canal, and hence preventing any ear infection. This blend is a mixture of natural and herbal ingredients such as Garlic, Mullein, Calendula, St. John’s Wort, Tea Tree Oil, Vitamin E Oil and Olive Oil. With this composition, the blend has soothing and calming properties which make it an effective remedy that bring rapid comfort to the infected ear by reducing pain, killing microbes and then healing in few days. The onion, excellent natural anti-inflammatory is THE product to have on hand in the case of ear infections. Not only does it relieve pain, but it also kills the infection. In addition, applying warmth behind the ear helps in relieving congestion and relieving the inflamed area of the ear. So, combining onion with heat is one of the best home remedies for ear infections. Cut half a onion into small pieces and pass it in microwave (bottom, about twenty seconds) or skip it in the skillet for 2 minutes, the important thing is that it still bites the eyes (in other words, it kept his antibiotic virtues). Wrap it in a cheesecloth or thin dishcloth. Position the wrapped onion in the cheesecloth over the painful ear and wrap it around the headband or cap to keep it in place. Keep all this in place for a minimum of 20 minutes and repeat the operation 3 times a day. 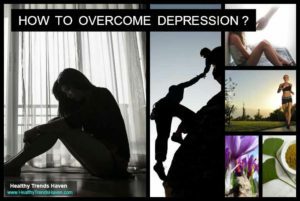 You can apply this remedy to childrens and babies too. One of the most recommended home remedies to reduce ear pain is dry heat. To do this, take a hot-water bottle, fill it with hot water, cover it with a dry, clean cloth and place it on the infected ear. The heat produces a calming and analgesic effect that will quickly relieve your pain. Wrap a towel soaked in very cold water around the neck near the ears. Immediately after, apply to the ear a washcloth impregnated with hot water. Every 5 minutes, refresh the towel and warm the glove by soaking them again in the water. Replace them in the same place. Repeat this step four times. This will take about 20 minutes. 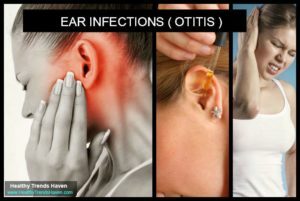 This method will immediately relieve the pain of ear infections. The use of apple cider vinegar in the ear makes it possible to restore the acid medium in the ear canal and provides additional protection against bacteria and other attackers which limits the development of these bacteria. On the other hand, alcohol has a drying effect, which is positive, because otitis externa (swimmer’s ear) develops especially in wet environment. The blend of white vinegar and alcohol will make a good natural remedy against this kind of ear infections. You will need white vinegar and 70% alcohol to achieve this concoction. Mix alcohol and white vinegar equally. Soak a cotton ball in this mixture and put it in your ear for five minutes. Remove the cotton ball after five minutes and lay on the opposite side of your infected ear to drain out the solution. Repeat this step at least twice a day to get rid of any water or wax present, or to cure your ear infection. Apply it to the infected ear for 15 minutes. There are several natural solutions to cure ear infections. We presented in this article the best natural and home remedies for ear infections. To be effective, a remedy must be chosen according to the type of ear infection. But to know the type it is necessary to know the cause of the infection. If you were not sure of the cause of the ear infection then one must absolutely see a doctor. In addition, if your ear infection persists for some days then you MUST consult your doctor.